NOTE: Knife is NOT included. 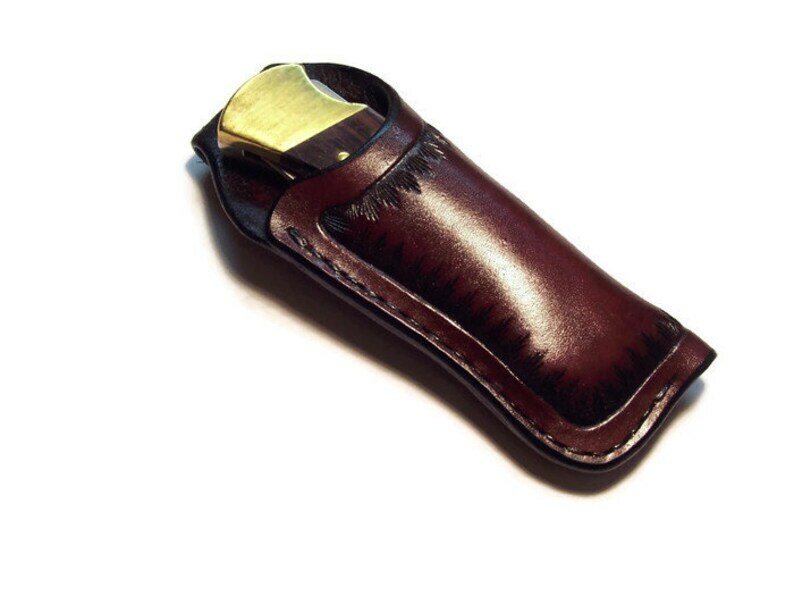 This is a Custom Leather Knife Sheath specifically designed to fit the Buck 112 knife but will fit any knife or tool measuring up to: 4 1/4" Long X 1 1/4" Wide X 5/8" Thick. Featuring: Premium heavy carving leather with a hand tooled grass border design, 1 1/2" stitched belt loop, recessed hand stitching, and hand rubbed finished edges in Chocolate Brown, Saddle tan , Mahogany (shown), Black, and Natural Leather color. A color chart can be found by scrolling through the photo's. Stitching is guaranteed for the life of the item. Can be ordered right or left handed on the belt at checkout. See other listings for ordering this sheath without the belt loop for pocket carry. This item is made as ordered and ships in 10-14 business days. If you have any questions, please contact me so I can help. Built to last and made in the USA!